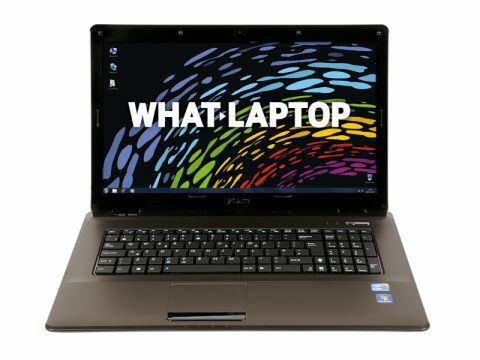 Asus may be best known for its Eee PC range of netbooks, but the Taiwanese manufacturer also offers a solid range of full-sized laptops. The Asus K72F-TY011V is a slightly more sizeable laptop and proves to be a highly usable machine, as well as a decent performer. Its 17.3-inch screen offers ample viewing space, but is still pleasingly sharp, thanks to its 1600 x 900-pixel resolution. It may not be as bright as some other screens, but it delivers deep blacks, excellent contrast and appealing colours. The bulky chassis is fairly large, while the 3.2kg weight is also the heavy if you're thinking of taking this on the commute. The chassis offers a solid if unexciting build, with a plain black finish, and we only noticed the smallest bit of flex around the area of the optical drive. Despite the hefty build, we still managed 249 minutes of battery life from a single charge - a better performance than most machines of this size. This is definitely a desktop replacement machine, but at least you can carry it between rooms without lugging the charger too. An Intel Core i3 350M processor powers this portable, with solid performance as a result. While the Core i5 laptops produce more power, the Asus can comfortably handle the needs of most users. Multi-tasking is no problem, with little in the way of slowdown, even with several applications open at once. The majority of the laptops at this price have integrated graphics, suitable only for basic multimedia tasks, and the Asus is no exception. Nevertheless, you can still watch HD video and even play basic games. The wide chassis leaves plenty of room for the isolation-style keyboard which comfortably includes a separate numeric keypad. While the keyboard doesn't span the whole width of the chassis, the keys are still well-sized and firmly mounted. The touchpad is also generously sized and responsive, making it easy to use. Networking is comprehensive, with 802.11n Wi-Fi for connecting to wireless networks and Gigabit Ethernet for wired connections. The 500GB hard drive is also fairly generous, offering plenty of room for your files and media. Four USB ports are in place and allow plenty of peripherals to be connected. A 3-in-1 memory card reader is also provided and can be used to quickly access your holiday snaps or other portable media. The Asus K72F-TY011V should satisfy anyone looking for a solid and dependable desktop replacement machine. Portability is limited, despite the impressive battery life, but this is a highly usable and dependably powerful laptop.